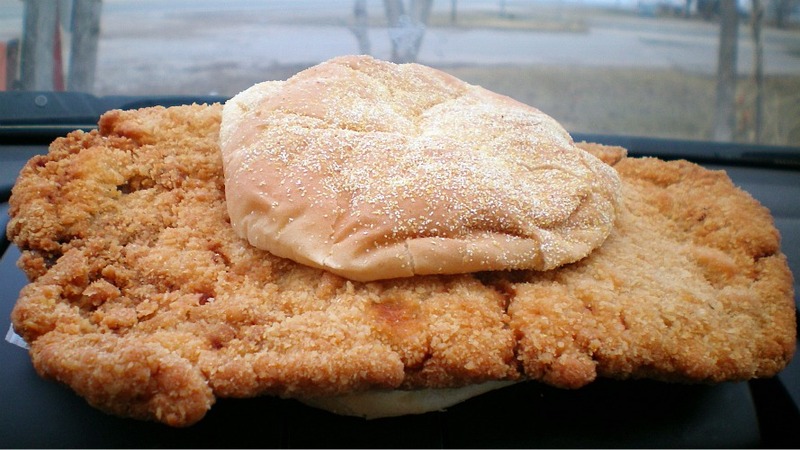 The Short Stop in New London is a small town drive-in just off the state highway in Southeast Iowa. A local newspaper article tells me that this place serves over a hundred of these a day during the busy summer months. 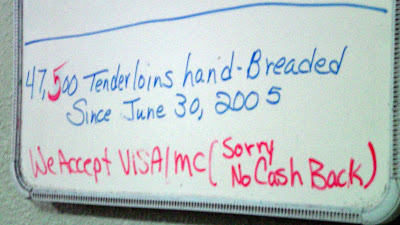 The owners have help promotions giving one lucky person a free tenderloin every month for a year, but it always seems to happen when I am not in town. 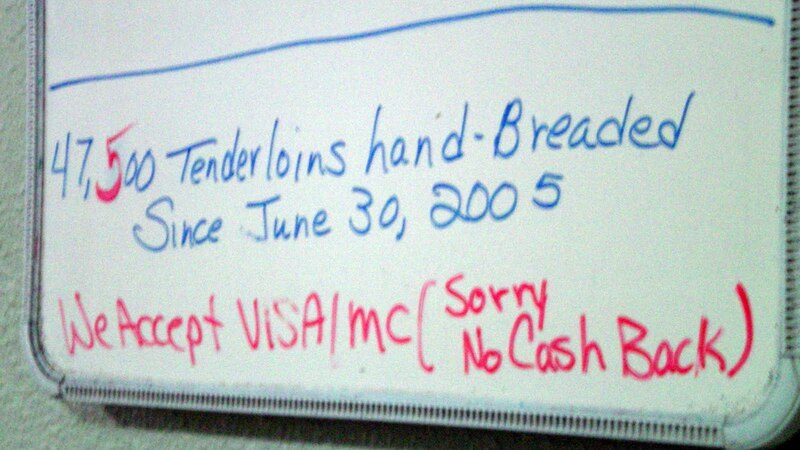 Online at: It looks like somebody set up a facebook page when they sold their 50,000th tenderloin HERE. 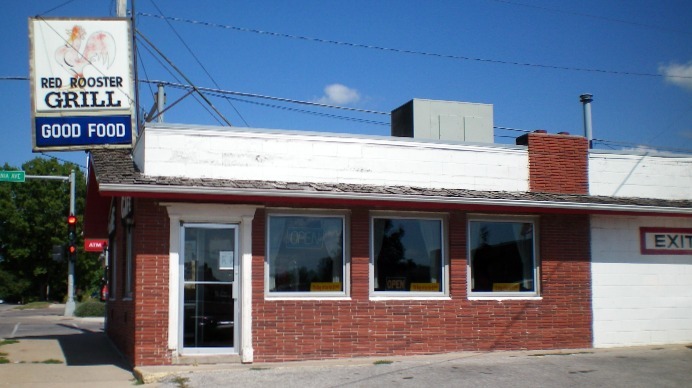 Location: 600 East Main St in New London, Henry County, Southeast Iowa. Directions: Its on the Eastern edge of town, Main St. has an exit from Highway 34. 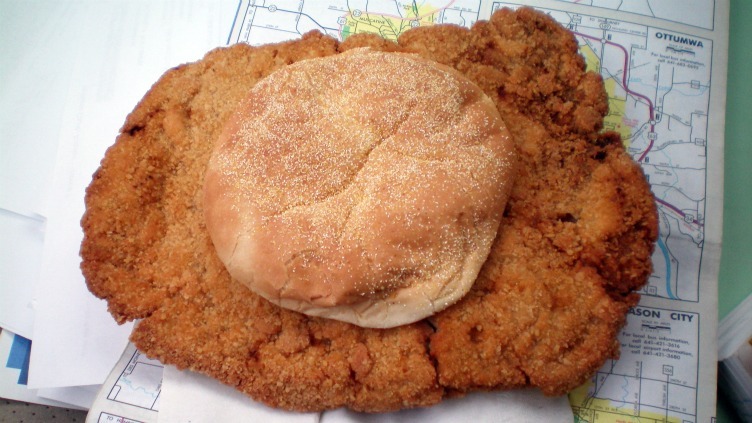 The Tenderloin: The meat portion was huge, feeling like at least twelve ounces. The shape was about halfway between an oval and a rectangle. Breading had a huge amount of crunch and eating this sandwich sent crumbs flying everywhere. 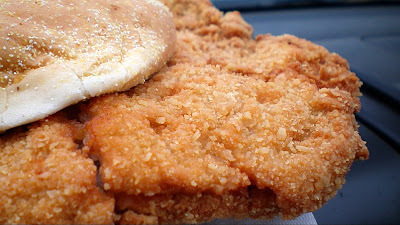 The meat was moist and a bit darker than some other loins, pounded thin and the ratio of meat to breading was a little lean. Served with all the fixins on a corn dusted bun. Overall 8.5 out of ten. 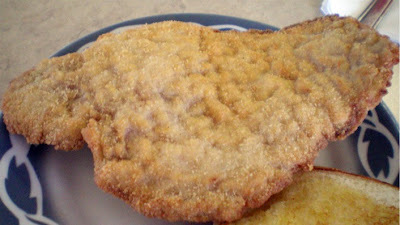 Price: $4.75, also available grilled,a good value. Also on the Menu: Full breakfast with biscuits and gravy, an ice-cream menu, and lunch with sandwiches, burgers, and fried stuff too. 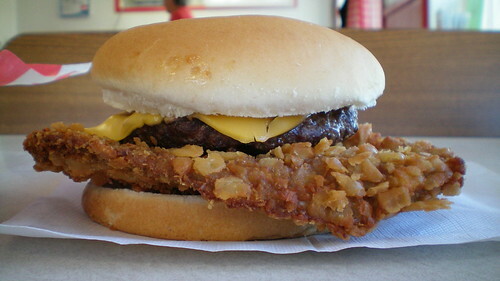 The Elk Burger is the Henry County specialty. Service: Its a walk-up with a window to put your order in. 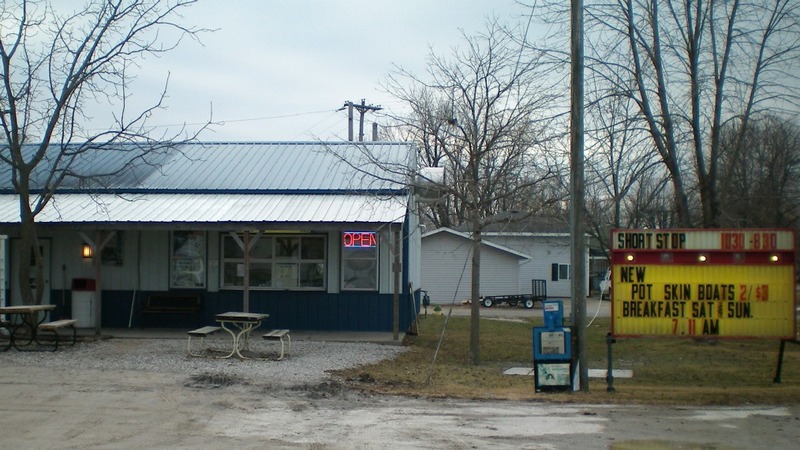 Ambiance: Its a small town drive-in with a small dining area inside, with picnic tables outside and a big gravel parking lot. Iowa Falls refers to itself as The Scenic City of Iowa, for its view of the Iowa River and a handful of historic buildings in town. You can read HERE about the Red Rooster Drive-In that once stood at the intersections of Highways 20 and 65 before burning down and being rebuilt. 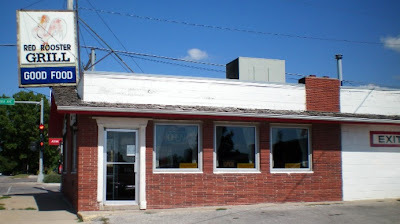 Location: 420 Oak St in Iowa Falls, Hardin County, in North Central Iowa. 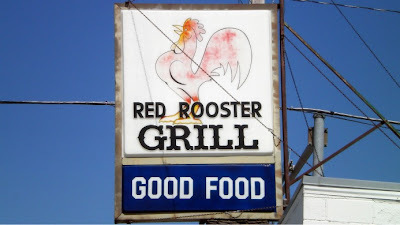 Directions: Its right on Highway 65, the main drag through town, look for the sign with a giant rooster. The Tenderloin: The menu mentioned proudly that this sandwich was listed as one of the best in the state of Iowa back in 2004. It felt like about eight ounces when I lifted it up. The cut and tenderizing processed had turned the loin into an elongated shape. The whole thing retained a ton of juice after it was cooked. 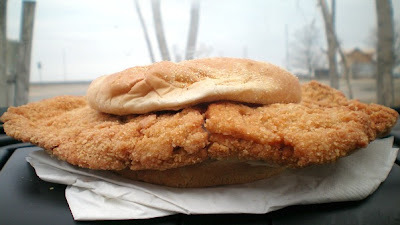 Served on a small toasted bun. Overall 7.6 out of ten. Price: $4.75 a la carte, fixings extra. 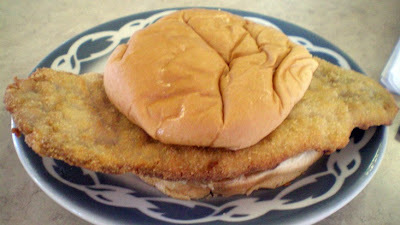 Also on the menu: Full breakfast, loosemeat burgers and pizza burgers seemed to be the highlights. They were sold out of pies during my visit. Service: It was seat yourself with table service and three old ladies running the show when I stopped by. Ambiance: The outside is plain, but the inside has cute old fixtures, and old counter area and booths for seating. the decorations are mostly pictures of Red Roosters. 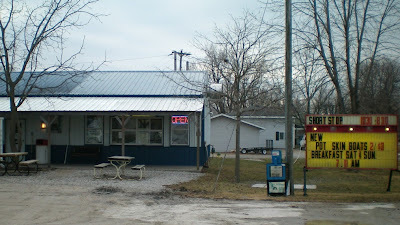 Final Thoughts: The cinder block building with the CAFE lettering and fading sign don't exactly draw the visitor inside. 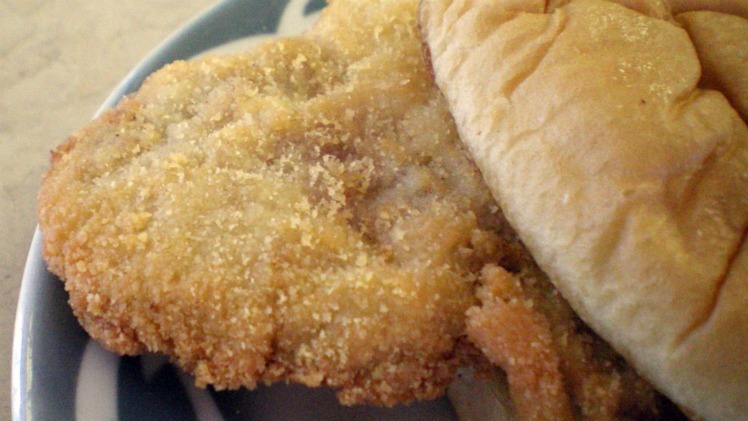 The promise of fresh breakfast, tenderloins, and pie should. When in Iowa Falls, its tough not to be entranced by the beauty the Princess Grill and Pizzeria just around the corner, which will probably be my next stop here.